Tiffany's birthday and mine are only 5 days apart. This year we decided that we would take a day off work and head to sunny LA to celebrate our mutual birthdays. Tiffany had booked our room at the Biltmore Hotel in downtown LA. It is a beautiful hotel that has been used to film countless number of tv shows, movies and music videos. In fact they were filming for the show "24" when we arrived which was really cool. Saturday we headed to one of my favorite stores Ikea for a little shopping before going to Venice beach. 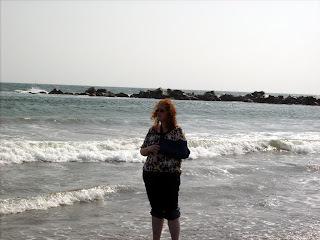 The weather was actually really chilly, so I wasn't too disappointed that we didn't stay at the beach very long. Tiffany got in some geocaching while I read a book. The final highlight of the trip was the Michael Buble concert Saturday evening. I had seen him perform once before in Vegas and loved it so much I had to see him again. When I purchased our tickets I had mistakenly thought we had really good seats, only to discover that we were sitting on the highest row in the nose bleed section. Although the seats were terrible, we still had a great time. Tiffany even mentioned that she would pay to see him again. A high endorsement from someone who typically does not listen to his style of music. Ooo, fun trip! Love Michael Buble. Love Wicked. Wish I could be there. :o) Your bruised and broken arm looks painful! I guess if you're going to suffer the pain, at least you have a good embarrassing story to have with it. Hey Krista! I am so glad I will be able to keep up on what you are doing by reading your blog. My husband got me into blogging about a year and a half ago and it is very addicting. 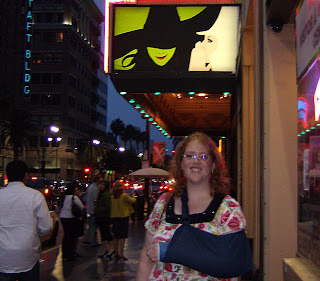 I LOVED the book Wicked but I haven't seen the play. I hope to see it sometime. I have heard some of the music and love it. Sorry to hear about your arm. That sure looks painful.